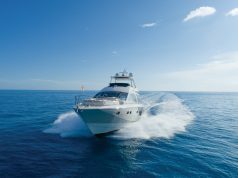 A motoryacht equipped with an enclosed flybridge can redefine your idea of cruise control. 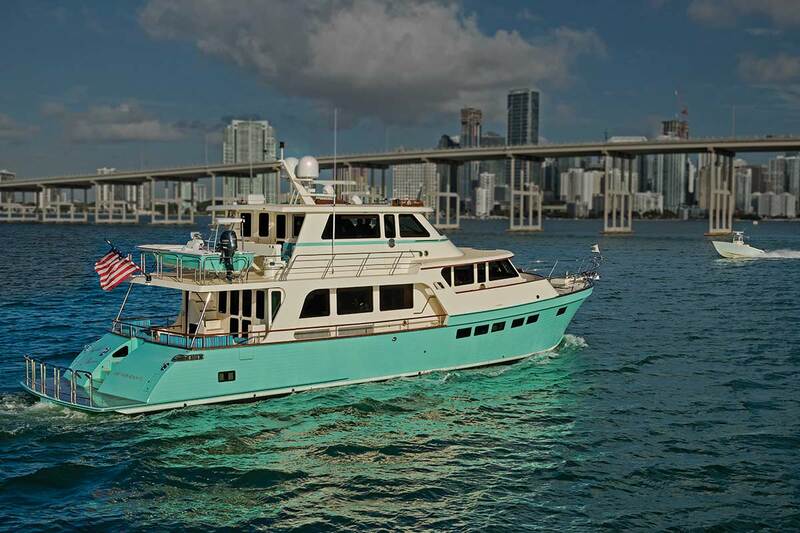 If you’ve ever wondered whether an enclosed bridge motoryacht like the Marlow Explorer 66E is right for you, take a few moments to consider notable weather you’ve encountered while boating. 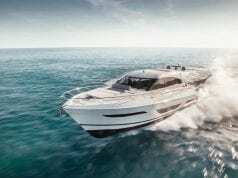 For me, the list includes a three-day motoryacht delivery from Lake Michigan to Lake Erie in 20- to 30-knot late-fall squalls while operating from the open, Bimini- and hardtop-less flybridge. Another trip involved shivering on deck and peering through a portable night vision scope at dark Atlantic waters on a fast-moving sedan yacht returning to Miami from Key West in the winter trying not to collide with anything floating in our unlit path. Then there was the mid-July run from Cape May, New Jersey, to New York Harbor in a large center console and feeling the heat like a Bessemer blast furnace roaring off the land ahead of an approaching front. When I consider how those experiences might have been improved had the yacht in question been the Marlow Explorer 66E, those scenarios all change to comfort for my crew and guests with better command and control from my helm perspective. 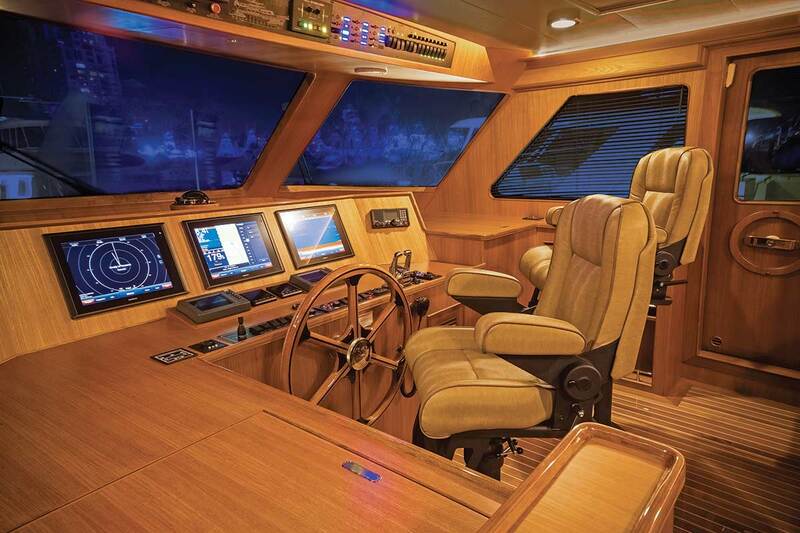 Marlow’s “Command Bridge” designation is more than appropriate equipped as it is with a helm console nearly as wide as the bridge structure and all controls on the centerline, including a large handcrafted teak wheel. Two custom helm chairs offer flawless views of the waters all around. 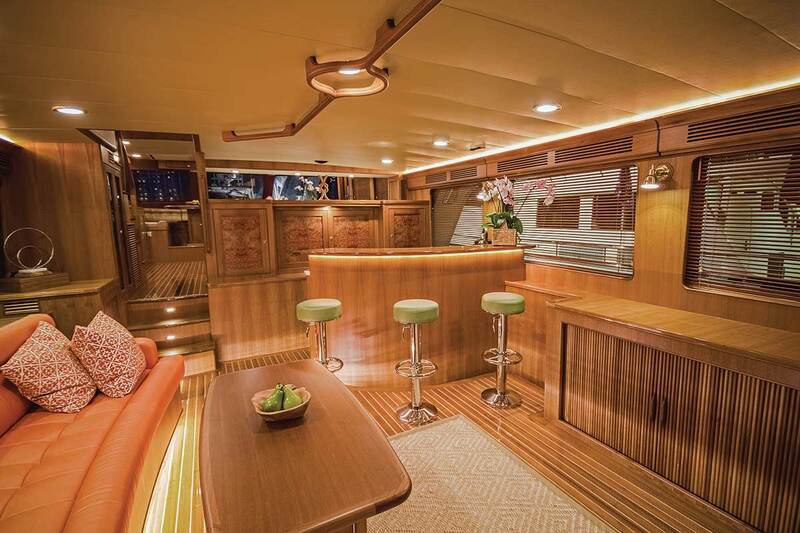 Aft and to starboard, the builder has provided a large settee and custom table for family and friends not participating in the yacht’s operation but wanting to enjoy the views nonetheless. 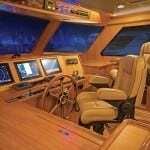 As befits a yacht of this caliber, there is more than enough room for three large displays ahead of the wheel (just a quick glance below the lower edge of the windshield), plus a large flat area beneath them for engine displays, binnacle, joysticks, and data repeaters. Communications and systems monitoring equipment is found in the overhead panel although there is an abundance of space in an extension of the console to port to house other navigation and communications equipment. 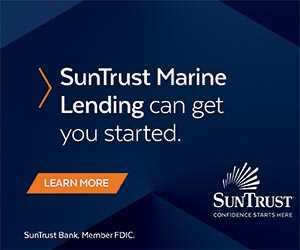 Two weathertight doors flanking the helm console and a single door on the aft bulkhead—all of which provide natural ventilation combined with overhead hatches when desired—create quick and easy access to the upper aft deck. Another settee and table are here for those guests who want to enjoy the open air or be entertained alfresco. A gas grill and outdoor kitchen are nearby, as is a desirable dayhead hidden away to port. Here you’ll find a crane and storage for the RIB dinghy plus enough space for a folding lounge chair when sunbathing is the daily plan. A built-in stairwell leads from the upper aft deck down to the lower aft deck, but my guess is that most of those aboard will transit to the main deck via the interior stairs leading down along the port side of the bridge. Leather-covered stainless steel rails—like the ones overhead on the bridge—are inset with plenty of clearance and placed judiciously for effective handholds when using the stairs in a seaway. The stairwell leads directly to the country kitchen and galley area forward on the main deck. 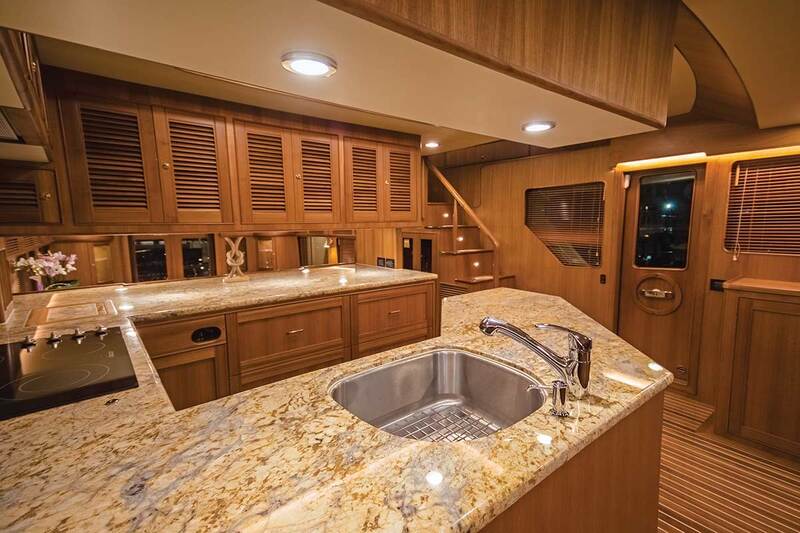 The U-shaped galley is directly ahead with a marvelous view forward and to both sides for the chef, as well as a raised dinette aft that shares those views. 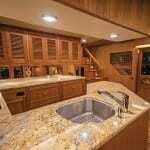 Polished granite counters are large enough for multi-course meal preparation and service as well as simple meals when underway. Storage overhead and below the counters is plentiful, and the equipment—SubZero fridge and freezer drawers, five-burner gas Dacor cooktop, and under-counter Franke sinks, to name a few—is everything a well-equipped chef needs. Two watertight doors provide quick access to side decks that are protected by the raised bulwarks of a Portuguese bridge for those who want to safely access the foredeck for anchoring or line-handling duties. The bulwark-and-handrail-equipped side decks lead aft and two steps down to the covered aft deck. Twin built-in settees with tables flank the centerline stairway leading down to the swim platform. One of the stairs is a hatch that opens to a large storage room where the genset (among other equipment) is mounted. A watertight door on the forward bulkhead leads to crew quarters for those who may occasionally want the services of professional mariners to operate or deliver the yacht. Another watertight door leads forward into the engine room. Twin 1,000-hp CAT C18 ACERT diesels take up most of the engine room but leave plenty of space for service. 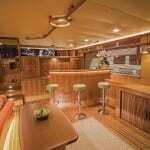 Back on the aft deck, twin doors open wide to reveal a spacious main salon with a bar and storage flanking the opening. A pair of loose lounge chairs to port and a large, comfortable couch to starboard provide abundant sitting space with an elegant custom wooden table in between. Two lockers provide small item storage along with a built-in writing desk forward. The storage hutch partially separating the salon from the galley and country kitchen has more storage and a locker hiding the large-screen TV. If you haven’t inspected a Marlow, the fit and finish of the interior is flawless—the epitome of the cabinetmaker’s and boat builder’s joiner work. Most lockers have impressive louvered doors for excellent ventilation. Three steps with more of those stout handrails lead up to the country kitchen and down the starboard side stairway to the foyer serving the accommodations deck. A single bed in the laundry room serves double duty for folding clothes or napping grandkids. 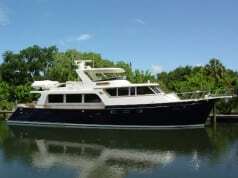 To port, the guest cabin has twin berths and an ensuite head with separate shower. Forward is the VIP stateroom, with an easily accessed island queen on the centerline, two hanging lockers and another ensuite head with separate shower. 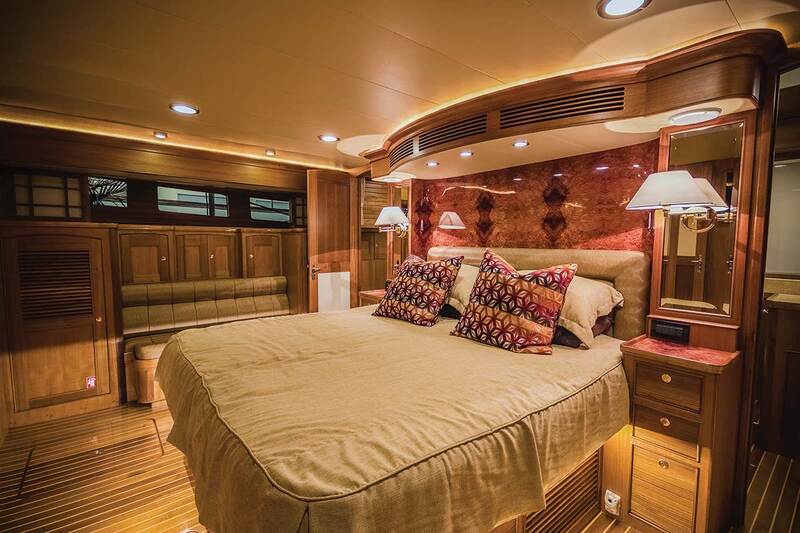 The full-beam king master stateroom is positioned amidships for optimal stability and comfort and is notable for massive built-in storage on both sides of the room, which is kept low to allow good views out double portlights on both sides. And as an unexpected luxury, the builder has provided not one but two marble and frameless glass ensuite heads with separate shower compartments for the owners. Since 2000, Marlow Marine has been building its Explorer line of yachts ranging from 49 to 97 feet in length in a Marlow-dedicated, award-winning “green” facility in Xiamen, China. David Marlow is committed to using only the best vinylester and epoxy resins in a trademark resin-infusion technology to make the lightest, strongest yachts. 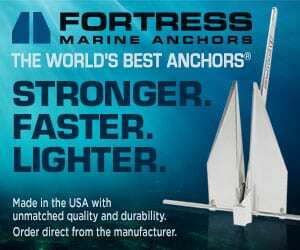 He is fond of saying that they have worked hard to get excess weight out of the company’s yachts while engineering them for efficiency, long service life and comfortable lifestyles afloat. In my opinion, the Marlow Explorer 66E is true to David Marlow’s goal of building world-class yachts capable of comfortable, long-distance cruising. And if you like the idea of exploring in a climate-controlled atmosphere, you only need to step aboard and examine one closely for yourself. Previous articleQUIZ: Are you a safe boater?